On March 7, 2011, Roger Oakland, founder ofUnderstand the Times, International, and two other members from his ministry attended the Peace in a Globalized Society forum at Saddleback Church in Lake Forest, California, which featured Rick Warren and special guest, former UK prime minister Tony Blair. Roger Oakland and his co-workers obtained eye-witness seats at the event that included well over 2000 people in attendance. Although cameras and recorders were not allowed in the main sanctuary where the interview took place, the UTT team took notes. Blair and Warren also mentioned they have been partnering with the President of Rwanda in an effort to develop a Purpose Driven country as an initial step to establishing a Purpose Driven world. In 2005, Rick Warren announced his global P.E.A.C.E. Plan to his congregation and then in 2008 announced that Rwandawould be the first Purpose Driven country. In 2003, he said of New Age sympathizer Ken Blanchard that he had “signed on to help with the Peace Plan, and he’s going to be helping train us in leadership and in how to train others to be leaders all around the world” (35-37 min mark). * Blanchard is just one of many “new” spirituality leaders whom Warren has turned to for assistance in building his Peace Plan globally. While Blanchard’s name is not mentioned much publicly by Rick Warren these days, Warren still sits onBlanchard’s Board of Advisors with a number of New Agers at Blanchard’s Lead Like Jesus organization. Blanchard has been promoting New Age mystical teachers for many years and even today sits on the Board of the New Age Hoffman Institute. In 2007, Blanchard wrote the foreword to a book that was “inspired by Hindu swami Paramahansa Yogananada. 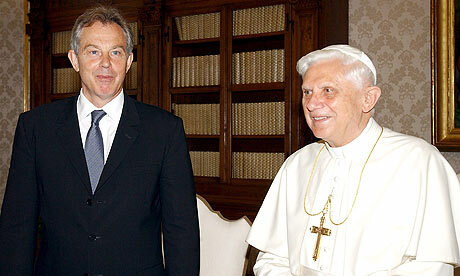 Will this Warren/Blair Peace Plan be one that is driven by mysticism? In a 2008 video statement, Tony Blair described his ambition to help bring about the United Nations Millennium Development Goals (MDG). In view of Saddleback’s recent day-long health seminar promoting the Daniel Plan where U.N. Agenda 21 ideas such as “sustainable living” “going green,” and “smart growth” were used, how interesting to note Blair’s appearance just a few weeks later at Saddleback. Is Rick Warren allowing the influence of the United Nations into his church and possibly into tens of thousands of other churches around the world? At the World Economic Forum in Davos in 2008, Rick Warren claimed that he “lead[s] a very small network of about 500,000 churches.” (40 min mark – That’s a potential of well over 200 million people!). 1. Alice Bailey, The Externalization of the Hierarchy(New York, NY: Lucis Publishing, 1976), p. 510; from page 123 of A Time of Departing by Ray Yungen, 2nd edition. « Rob Bell ~ A Universal Reconciliationist? This is so in our face. How can they be so deceived?